Tethering refers to the connection of a smartphone with a PC or PDA for sharing internet connection via GSM or UMTS. The phone is taking the role of modem here. This feature is in Windows Mobile also called Internet Sharing. We published about some Tethering Apps for Android and a regular user is keen to know about Tethering. Whether Tethering can be done or not, that depends on the Operating System running on the mobile device. For example, with Android, Tethering can be done using apps and some other hardware parts to connect. The two devices can be connected to a cable or wireless with Serial Cable, USB cable, PC Card (aka PCMCIA ) or ExpressCard , IrDA (infrared) or Bluetooth technology. 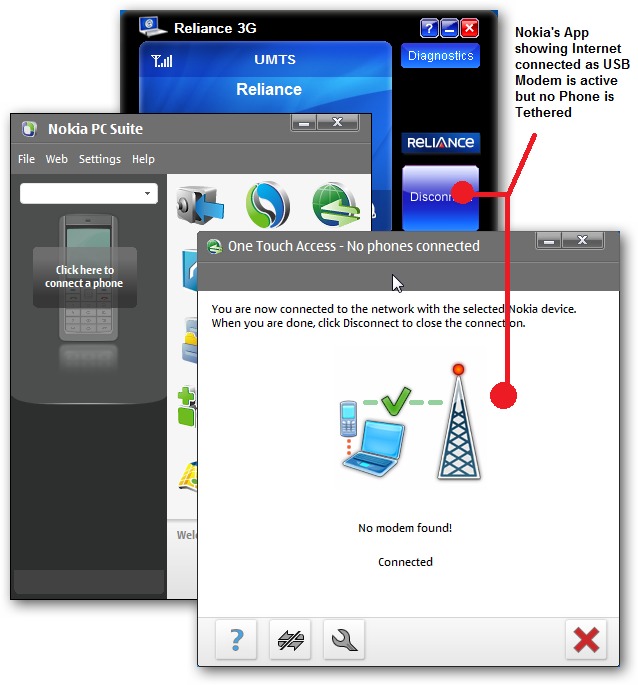 In Wireless the mobile phone is connected via software Hotspot. It is through the programs of some devices ad-hoc network is set up, taking up an encryption with WEP specifies (according to the IEEE 802.11 standard). Tethering is available as a downloadable application on most Symbian mobile phones – Nokia is probably the oldest legal version of Tethering way provider. The phone after Tethering can be used to surf the Internet as the SIM card of the Mobile device has access to the Internet. The mobile network operators as contract can prohibit to use the Internet using Tethering. This feature which can disabled by some operators and can be re-enabled again by rooting the devices and using Linux iptables application. This Article Has Been Shared 1279 Times! Windows 7 and Mac OS X: which one is better? Microsoft and Apple compete with the new versions of their operating systems those launched two months apart. Thecustomizewindows presents an honest comparison after using both the operating system for more than one year. ATM or Automated Teller Machine is a complex technical device for cash withdrawal or deposit from banks.City Bank of New York introduced ATM first time in 1939. Cite this article as: Abhishek Ghosh, "Tethering : What is Tethering of Mobile Devices," in The Customize Windows, May 3, 2012, April 18, 2019, https://thecustomizewindows.com/2012/05/tethering-what-is-tethering-of-mobile-devices/.